In case you don’t recall the original story, click here. Lisa says that cookbooks can be ordered from her for $20. Call her at 512-406-1623. The moment you’ve been waiting for…announcement of the winners of our 2014 Morris Community Cookbook Awards! First place and $2,500 is awarded to Maine Family Favorites from the Bangor Federal Credit Union of Bangor, ME. Prize money goes to the Campaign for Ending Hunger in Maine. Second place and $1,000 is given to Treasured Recipes and Projects from Boise, ID. Award money will be used to support The Junior League of Boise. 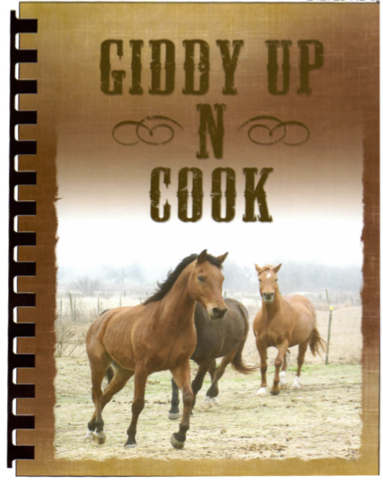 Third place and $500 is awarded to Giddy Up N Cook from The Event Staff Buyers Group of Coupland, TX. Prize money will go towards Youth of Texas. Congratulations to the winners, and thank you to all the organizations who submitted a cookbook for consideration. This was the final year for the contest. We want to thank all the organizations who submitted an entry over the past 15 years. During that time, Morris Press Cookbooks awarded more than $116,000 in prize money. It has been an honor and privilege to have been a part of your fundraising efforts. This entry was posted in For Sale, What's New? and tagged Event Staff Buyer's Group on March 11, 2015 by Stewart Dale Spencer. The Event Staff Buyer’s Group is a 501c3 non-profit that supports Texas youth who participate in local livestock shows. We have put together an awesome hardcover cookbook with 450 recipes and all original artwork. The cost is $25. It would make a perfect Christmas gift for the chef in your family! All money raised will go to the kids, their projects, and their goals. As a non-profit, your donations qualify for charitable tax exemptions. Get your book today and help support the youth of Texas! Go to www.eventstaffbuyersgroup.org to order and/or ship online. Go to Manville Water in Coupland, a proud supporter, to examine or purchase your copies. For additional copies, questions, or information please email [hide_email lisahammondrodeo@hotmail.com] and I will be happy to work with you or your organization. Thanks for your support! This entry was posted in For Sale, Social, What's New? and tagged cook book, Event Staff Buyer's Group on December 5, 2013 by Stewart Dale Spencer.